We provide the very best dog home boarding near you in the Torbay, Newton Abbot, South Hams and South Devon area. Dogs deserve a holiday too! Hello from Jennifer, Carolyn and Terry! We have been proudly running your local Barking Mad dog sitting service in the Torbay, Newton Abbot, South Hams and South Devon area since early 2008. It’s the very best dog home boarding near you. We are a doggy mad family. Jennifer and Carolyn are sisters and we are joined by Jennifer’s husband, Terry. Jennifer and Terry have a Golden Retriever called Sidney and Carolyn has a young Chocolate Labrador called Hettie. We work very hard to provide you and your dogs with excellent, worry free holiday experiences as an alternative to kennels or house dog sitting. Before your dog’s first holiday, we meet you and your lovely dog in your home. We chat and find out all there is to know about your four-legged friend. We think this initial meeting is so important as it allows us to get to know your dog and enables us to make the perfect match with one of our great dog loving host families. Our hosts are very special dog mad people who really look forward to having Barking Mad dogs to stay. 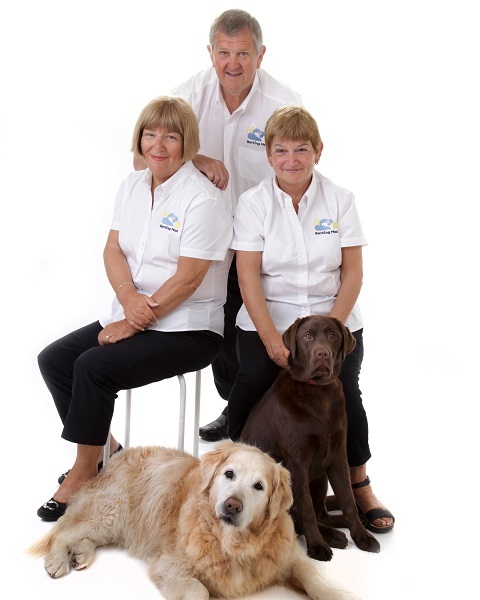 We select them very carefully and they have years of experience of caring for dogs. They will treat your dog as though he/she is part of their family. We realise how hard it is to leave your precious dog with strangers when you go away. We collect your dog and all their favourite belongings from your home and take them to their holiday home. We check that they are happy and settled with the host family and let you know so your mind is at rest. When we return your dog after their holiday we will give you loads of feedback about your dog’s stay. When you book again there is a very good chance that they will return to the same host family. So when you are planning a holiday please contact us to give your dog as good a holiday as you. If you are missing a dog in your life and would like to host for us as much or as little as you like please contact us.